There's no party like a wonderfully executed New Year's Eve Wedding (Party)! Sarah and Josh said 'I Do' on December 31st, with their close friends and family, at The Georgian Hall in downtown Athens, Georgia. The entire planning process was a blast, and we were on the same page throughout! It's always a wonderful experience to be able to plan and execute our clients' dreams and visions for their special day. And honestly, we squealed with delight when we got the 'okay' to have confetti canons for the stroke of midnight. It did not disappoint! All in all though, Sarah's love for a clean and classic style with a touch of contemporary made it a breeze for us. She let us know what she liked and didn't like, and working closely with all of the vendors to ensure it was perfect was such a joy! We worked with Oconee Printing for the custom designed monogram which can be seen on the invitation suite, matchbooks, koozies, and champagne glasses. 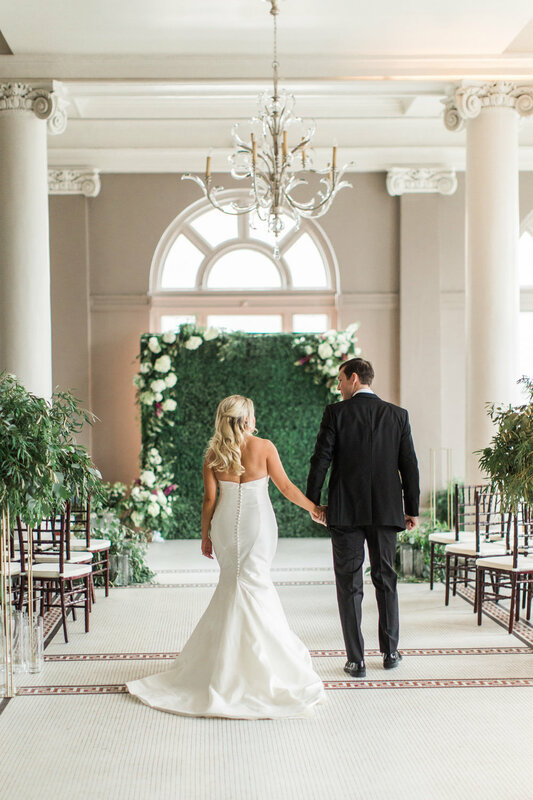 We were sure to include a wide variety of white and green florals throughout the space, seeing as the design called for simple sophisticate, and we are thrilled to share some of our favorite images with you here! Everything from the specialty linens to the custom lighting and fun beats, provided by David at Sound Insight Productions, we created an atmosphere worthy of the occasion. Don't miss out on their wedding day video at the bottom - it's one for the books, you guys! The team at Loree Videography nailed it, to say the least!